In Venezuela the novelty was to give that power of diminishing political rights to an appointed crony of Chavez who can ban whoever he wants, even if that person has not stolen a paper clip, even if the state has not suffered any prejudice. It is is enough in Venezuela that you used money allocated to buy pencils to buy paper instead and off you go into political oblivion. This of course does not apply to Chavez who can steal, mishandle, give away whatever he wants from the public treasury and Clodosvaldo Russian will make sure that any accusation will never prosper. 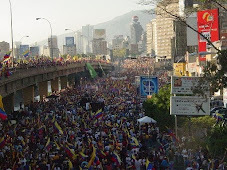 This not only happened to Leopoldo Lopez in 2008 but also to hundred of other people, by and large anti Chavez, and I am sure that if we were to look into the few chavistas banned we would probably find a fair percentage of these to be victims of some political motivation rather than any actual stealing. But Leopoldo fought all the way to the Venezuelan high Court who ruled against him and the other hundreds of guys. So they went to Washington, the the International Commission of Human Rights where they won their case. And it is the IACHR who is suing the Venezuelan government in Costa Rica, not Leopoldo and the victims he now represents. Unless something major happens it is more than likely that the Venezuelan government will lose its case: after all the point here is that no one can be barred from any civil or political rights without a fair trial in a court of justice. That is not in question. What the Court in San Jose will settle is that the Venezuelan government can ban from political activity only those who were sent to a court of justice and lost their case, something that did not happen in the hundreds of cases for which the Venezuelan Government is sued for this week. For one, I cannot see how the Chavez regime can wiggle its way out this time around and that is what makes this case even more interesting: what will the regime do once it lost the case? The first thing to notice is that for all of its propaganda the regime is taking this case seriously and even as it tries to disqualify the court it is still sending a high ranking commission of lawyers and representatives of Clodosvaldo Russian to defend it. It is possible that a regime that has become so disconnected from international reality and which lives in an ideological bubble might think it can win. But what will happen if it loses? In other cases treated at the commission or the OAS court, the regime has simply refused to abide by the ruling. But that was then and in an era where the MENA countries are walking fast toward democracies and where the star of Chavez is fading, refusing to acknowledge such a major case will come at a high price for the regime, a regime already highly questioned for its lack of independent judiciary. It is important to notice that if the hunger strike of the students succeeded in one thing last week, it was in exposing that the judicial system of Venezuela obeys the wishes of the regime. For all the separation and independence of power propaganda, when the regime decided to release political prisoners to end the strike it did so and we never saw a judge visiting the striking students to "negotiate". The regime is thus reaching San Jose in a very weak position, but also at a time where it is scared and losing control of the situation. I suppose that the calculation of the regime is that right now, still fresh from the legislative coup d'etat of last December, it needs to save time and refurbish its image and thus plays the game of going and defending its case. But the verdict will come at the earliest in three months from now and by then the regime will decide whether it is convenient to accept the Court decision. And I need to yet stress this once more: and adverse decision by the court will be very, very damaging for chavismo and Chavez, whether they accept the ruling or not. Which means that the calculations of accepting the ruling will be solely based on internal politics at the end of the year as to which affects the most Chavez reelection bid of 2012. By the end of this year Chavez will not care anymore about international opinion at all, only about what pays off internally. His cynical calculation is that with oil back at 100, once he is reelected he will try to pull a Qaddafi and "reconcile" with the West, and maybe then accept the negative verdicts he received in international courts. That is the ways thugs operate. You read it here first, remember. I have summarized many of the elements on the above text, but if you want to check it out you can go to the web page that Leopoldo Lopez set on this subject, in English, with plenty of details on that matter. You can still sign the petition in support of Leopoldo and the hundreds of people that are deprived of their political rights. This is NOT OT: Did you watch Gaddafi talk to Western journalista about how his people love him? Then you have the answer about how Chavismo will react to whatever anyone says on this case of inhabilitaciones. Same thing. what will the regime do once it lost the case? It will do absolutely nothing. The reason? Which means that the calculations of accepting the ruling will be solely based on internal politics at the end of the year as to which affects the most Chavez reelection bid of 2012. Chavez is not about to let dark horse Leopoldo enter the presidential race fray. That should be evident to all. The government knows they lost already. Russian has already said that the decision of the IACHR won't be executed. What can you expect, when Chavez supported Gadaffi again last night. Not necessarily. If letting Leopoldo run can create divisions within the opposition the regime could let him run. In politics 6 months is a life time and we cannot foresee what the situation will be in October, the latest date at which the IACHR should release its decision. Perhaps I should have said that Chavez will only allow Leo to run, if such action, as you stated, will undermine the opposition even more. Although at this stage, there's absolutely nothing the Venezuelan people can do, lest of course, to rebel a la Tunisia/Egypt/Lybia, to impede the dictator from 'winning' another election. In some aspects this has been a technical omission by Chavez's government.For convenience sake, they didn't go through the trouble of setting up hundreds of trials to have judges legally convict and disqualify the victims.If they really want to they would have no trouble doing so as they totally control the judiciary. It is not inconceivable that after the ruling, the government will say," If you want an official trial we will give you one", and have Leopoldo duly convicted. The allegation of "corruption", without any need of proof, fulfills this function in Chavezistan. While Chavez claims that it is fundamental that Venezuelans can re-elect their President, he should be able to understand that this implies that Venezuelans, not some bureaucratic ayatollah, should determine who may stand as a candidate for President. An interesting article from Huffington Post. My first thought is that if the lose, Chavez and combo will say that is an intromission to Venezuela's internal affairs, that the have been manipulated by the dark force of the evil empire, that Lopez is lying and a corrupt, and there will be consequences, blah, blah blah, as they always do, and then convict Lopez to "prove" they were right. My second thought is that, if they lose and actually get scared about international reputation, they will say "sure, we will review the files", and let it sit in "reviewing stage" until after the elections, like it is happening with the deaths of the caracazo. Under the OAS Charter, exactly what punitive measures are available to the IACHR, to enforce its decision? I mean, does a loss in this tribunal have any real-world consequences to Chavez, other than loss of face? Why wouldn't Chavez simply claim that the IACHR is meddling in Venezuela's internal affairs, blame the Empire, and let it go at that? IACHR, Roy, has no army, just like the Vatican. And yet the Pope won the war in the end. A country can only be for so long outside of the international proceedings. a lot of problems can happen when you refuse by international rules, for example, no more international credits, no more investment outside of commodities production, no more fiscal paradise for you either, etc, etc.... It takes a long time but eventually there is not enough oil to compensate for that. I do get that it is just one more nail in the coffin for Venezuela's international legitimacy, but I was wondering if there any more short-term repercussions from a loss in San Jose. not dramatic. after all the regime has already lost some cases and did not abide by the ruling.